This entry was posted in Musings and tagged blue, card advantage, control, deck, draw, eldrazi, evan erwin, mtg, rise of the eldrazi, spoilers, standard, t2. Bookmark the permalink. Yo! MTG Taps! Episode 14 – Now Available! 100% agree. I especially like the wrath/wall soft lock. Seems to protect a certain $60 planeswalker quite well also. That $60.00 planeswalker can also bounce back the wall should another instant or sorcery need to be relearned from the graveyard. 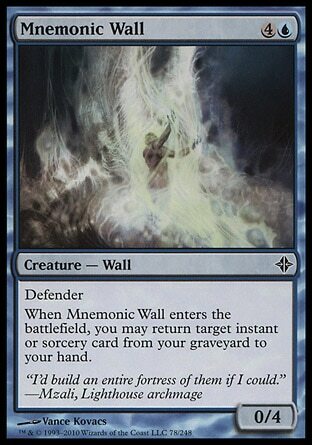 I like your argument about how this is better than Eternal Witness in the aspect that the wall forces people to overextend to deal damage. I’ll also add that the wall is blue, meaning that green doesn’t have to be splashed in for recursion. This card looks like it’ll be fun with Grim Discovery. Get this back + a land, play this and get back Discovery. It’s not Life from the Loam, but it’s going to be in Standard. The blue answer to cascade? Polymorph into Mnemonic Wall into Martial Coup?